Cameron, washing his hands of the matter, says you're on your own - run for it! He would have us jump from one frying pan into another frying pan! Information on price rises from the Consumer Futures website reveals the futility of switching. The cheapest electricity provider is hardly ever also the cheapest gas provider. 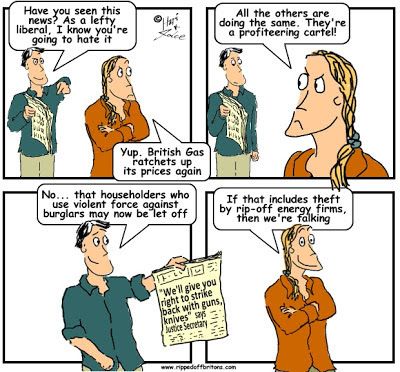 And while British Gas has offered the least shocking deal on electricity most of the time in recent years their suffocating gas tariff will have given you a right roasting overall. Taking gas and electricity prices separately there is a hundred or so pounds difference a year between lowest and highest. But taking both together the Big Six march a very disciplined pricing goosestep. Whoever you are with you will get a kicking. Switching is not the answer. The energy companies operate like a wolf pack. Switching merely lets you choose which wolf will bite you. The answer is to blow away all hot air and smokescreens deployed by energy companies to disguise their rip-offs. Hot air that is inhaled and exhaled uncritically by politicians, regulators, and the media. When in 2011 OFGEM's own consultants BDO showed them how to bring greater transparency to the market, OFGEM decided not to. And what about the energy companies' contention that they are forced to put up prices because of government imposed taxes and wholesale prices? We'll come to that in a separate post, click here. Its not something "everybody" can do. Not if you have a poor credit history; in shared accomodation. And those on prepayment meters - try switching your supplier if you are in this situation! The rich and more affluent will be able to switch for short term benefit. But unfortunately the poor will just have to pay more and more. Not only is our "choice" limited to which wolf should bite us but we can't compare like with like even then. Guessing what future use I might make in fixing prices is not helped by the big 6 using different fixed rate charges before adding on their variable costs per unit. Trying to calculate a crossover / breakeven point is difficult enough given the variability in weather in the future but after modelling different possible scenarios the difference between the big 6 (when prices are stabilised) is so paltry as to make the exercise a waste of time and effort. This is not the competitive downward pressure we were promised. It is crying out for tougher regulation to bring about real competition. If this is not possible then we should renationalise and move on. I don't agree with your numbers on switching - having reviewed the data the 0.7% is for the month June 2013 only. If you calculate the whole year this is 11.3% for electricity. I would clarify the data point you are making in your article as it is misleading given you say "By 2013, having realised the futility, the number had more than halved to 0.7% (less than 1 in a hundred)." I will make the clarification. Thanks. Switching is easier said than done. I've heard stories of people being billed astronomically months later for hidden cancellation fees etc.. According to a report in the Daily Mail, switching sites use the "show energy deals we can switch you to today?" to only show companies who are paying the switching site a commission. To get other deals you have to untick this - apparently only 1 in 20 people actually do this.